Highlighting the impressive versatility and pertinence of the solution to the industrial print sector, the S-Series was also put through its paces direct printing onto the more ‘mainstream’ industrial application of machine control panels. Based on proven Roland DG UV-LED digital print systems, the VersaUV S-Series is built on a modular concept. Devices can be configured to a range of widths and lengths on a flatbed chassis or belt fed system (which includes a media table for direct print onto rigid objects of any length) to provide a product range of seven pre-configured systems, capable of printing up to 200mm in height and 100kg/sqm in weight. Perhaps of greatest interest to industrial users, where solutions often have to address complex and unique printing requirements, this modularity offers viable solutions for the most demanding and diverse printing needs, now and in the future. Ultimately this means the range of potential applications is extensive and offers previously impossible creative opportunities, whether printing onto rigid or flexible, thick or thin, heavy or light and sensitive materials - virtually any type of substrate can be effectively printed with the S-Series. From direct print onto alloy wheel rims through to delicate roll media which is incompatible with a standard roll-fed machine, and almost everything in between. The S-Series reverse vacuum function makes it easy to position and set-up heavy or hard-to-handle objects and when configured as a roll-fed system, the roll is continuously drawn over the vacuum belt, so there are no pinch rollers to damage the surface of soft or sensitive material. With a system as diverse as the S-Series, the range of applications currently being produced out in the market is vast. One user, for example, is printing highly personalised one-off phone covers, hundreds and even thousands at a time - all different designs, all made viable thanks to Roland DG variable data RIP software driving Roland DG digital print hardware. The VersaUV S-Series can also print special 3D effects with UV Gloss ink printed in layers to build up visually interesting effects such as embossed features and textures on high-end point-of-sale panels, braille for labelling and decals, and even a crocodile skin effect printed directly on to your smartphone. 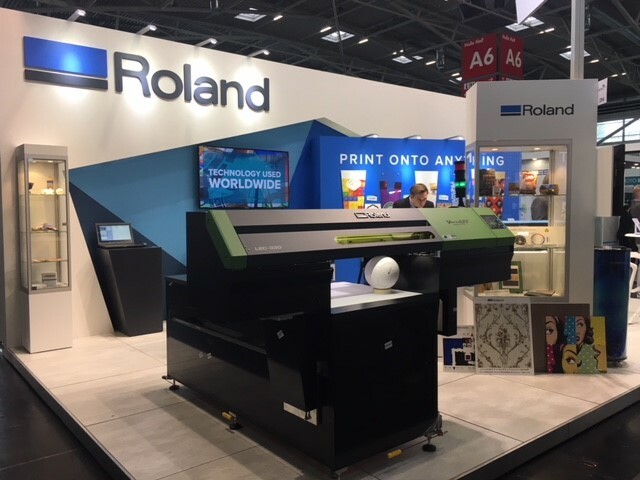 Depending on the type of work you do today, or are thinking of doing in the future, Roland DG is committed to working with customers to create a S-series configuration to meet their specific technical and budgetary goals. Indeed, the sheer scope of what can be achieved is far broader than can be covered in this blog, so my suggestion to anyone with a printing requirement that is outside of the norm, is to talk to Roland DG and learn more about the capabilities and customisations of the new S-Series range. For further details visit rolanddg.eu.